Flying Lizard Motorsports will begin its 2013 ALMS GTC campaign later this week at the ALMS Winter Test at Sebring Raceway in Florida, utilizing two full days of testing on February 7th and 8th. The team will test its new 2013 No. 44 Flying Lizard Porsche 911 GT3 Cup car, running three drivers through the car: Spencer Pumpelly, Nelson Canache Jr., and Archie Hamilton. Spencer Pumpelly (USA) has competed twice with the team, at the 24 Heures du Mans in 2011 and 2012. In 2012, Spencer also finished 3rd in the ALMS GTC drivers championship (with The Racer's Group) despite missing one race due to a scheduling conflict. His experience racing in GTC with the Porsche Cup car will provide a good head start for the team for its 2013 season. Spencer will race in the full 2013 ALMS GTC championship with the team. Nelson Canache Jr. (Venezuela) brings a wide range of competitive racing experience in a variety of cars, including three Venezuelan national championships in Formula Ford and GT Super Touring. His 2013 has started very quickly in the GX class at the 24 Hours of Daytona, becoming the first Venezuelan to win that race in its 46-year twice-around-the-clock history. He also won the 2012 24 Hours of Mexico and was on the podium in his first ALMS race, the 2012 Petit Le Mans. 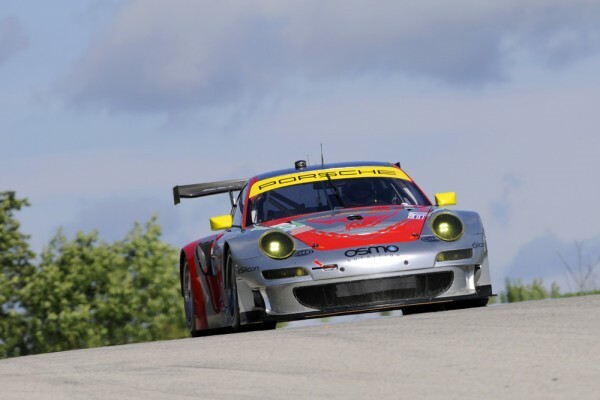 Nelson first tested with Flying Lizard in January at the team's the inaugural run of the GT3 Cup car and will be joining the team for the 12 Hours of Sebring race as well, with further events to be announced for the 2013 season. Archie Hamilton (United Kingdom) raced a full season in International GT Open in a Porsche 911 GT3R, finishing 3rd in the GTS driver championship. In 2012 he also won the Baku City Challenge race last year in a GT3 Cup car for Konrad Motorsports, as well as being selected as one of only 10 MSA Academy drivers. Regarding the testing opportunity, Hamilton added, "It's a fantastic chance to test with such a successful group as Flying Lizard, and after a strong season in the 911 GT3R in GT Open, it's great to be recognized by the team. I hope to do a good and professional job and race with the team in the American Le Mans Series in 2013." Flying Lizard engineer Steve Conover will be managing multiple objectives at the Sebring test, working to come up to speed with a new car and a new (to the team) Yokohama tire, as well giving each driver familiarization time with the track and with the team. While Spencer has extensive racing experience at Sebring, this will be the first time at the track for Nelson in a 911 and the outright first time at the track for Archie. Steve made significant progress with car setup at the first test but the unique demands of the Sebring racetrack will add additional complexity to his pursuit of a fast setup for the GTC car. Car No. 44 driver Seth Neiman will miss the Sebring test and the first races of the season in order to recover from a shoulder injury incurred during an offseason surfing excursion. However, he will be with the team at the each event and back in the car very soon. In addition to the No. 44, the team has taken delivery of a second new 2013 GT3 Cup car and is putting together a full season, two-car championship effort. Thomas Blam, chief strategist, explained, "We're very happy to have the opportunity to expand to a two car program for GTC this season. Having a second car will bring great benefit in terms of setup work and shared information and resources, but also it will allow us to best leverage the team we have built over the last nine years of racing in the ALMS. We really will miss having Seth in the car for the start of the season, although we'll use that as an opportunity to introduce some new drivers to the team. We intend to put strong cars and driver lineups on track at each and every event and will pursue the driver and team championships as a primary objective for our first season in GTC."